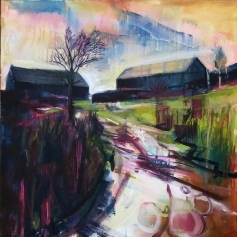 Bev Dunne lives and works in the heart of Snowdonia in the beautiful valley of Cwm Croesor. She is constantly inspired by her surroundings and her work aims to capture an essence of the environment in which she works. A response to the contrast between mountain and valley, moorland and lake, river and sea. 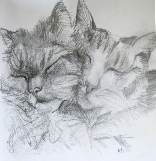 Bev has been a full time artist for over ten years. 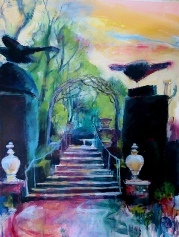 She paints primarily in acrylic, a medium which responds well to the technique of layering, wiping and scraping often employed in her work. Paintings often remain on the edge of abstraction, on the edge of reality and are often dreamlike in their subject and appearance. 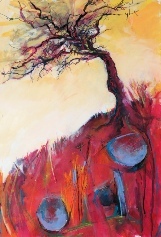 She uses colour to evoke her reaction to the landscape, tuning into the energy of the earth and man’s interaction with it. If you wish to learn more about Bev please go to the about page or if you wish to contact her or join her mailing list please visit the contact page. 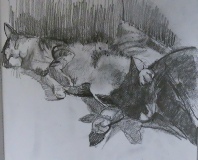 Bev is currently taking part in 28 Drawings Later’, a drawing challenge and social networking project on Facebook which invites artists of all abilities to submit a drawing a day during the month of February. ‘The result is an evolving, month-long, participatory online gallery which encourages everyone, artists and non-artists alike, to see what might happen if they made time to draw every day for a month’.